On 15 July Alexander Milinkevich and Andrei Sannikau participated in a round-table discussion on Belarus in Warsaw. Although they both belong to the Belarusian opposition, their views on how to improve the situation in Belarus are not the same. The leader of European Belarus Andrei Sannikau and the leader of the Movement for Freedom Alexander Milinkevich advocate different approaches when it comes to sanctions, participation in the elections and dialogue with the authorities. Milinkevich often says that if there is no dialogue between the regime and the EU, Belarus will lose its independence. Sannikau strongly argues in favour of the imposition of sanctions and accuses the EU of being too soft. The first camp (“revolutionists”) believes that the international pressure on the government can change the regime. Therefore, the West should necessarily impose sanctions on Belarus and limit all contacts with the officials. According to the second camp (“evolutionists”), changes in Belarus will come from the bottom upwards, a more evolutionary approach and focus on the grassroots work with society. Instead of sanctions, this camp believes in Belarus’ engagement with Europe, including its officials on various levels. The “revolutionists” camp supports the imposition of sanctions against Belarusian companies and individuals. the Charter97 web site remains the main media instrument of this camp. This camp believes that the sanctions put pressure on the regime in Minsk and is the only language which the regime understands well. By terminating the trade of oil products and potash fertilisers with Belarus, as well as the freezing of bank accounts and cutting off communication will create the necessary pressure to release political prisoners and the eventual fall of the regime. This camp believes that in today’s Belarus, there is no need to participate in elections, and the opposition taking part in them have become partners in crime. In 2012 this opposition camp boycotted the parliamentary elections. Also, this group boycotted the previous parliamentary elections in 2008, but took part in the presidential campaign in 2010. The revolutionists see no sense in holding a dialogue with the regime of Lukashenka. In their view, the dialogue only strengthens and legitimises the regime in Minsk and is immoral. The evolutionists argue against economic sanctions towards Belarus. The For Freedom movement of Milinkevich, the Tell the Truth campaign and Party of the Belarusian Popular Front belong to the “evolutionist” camp. These organisations also support the recent “People`s Referendum”. According to this camp, economic sanctions can be imposed only if the Belarusian opposition gains broad support in society. Otherwise, the sanctions would only increase Russia’s political and economic grip on the country without strengthening the opposition. This camp believes that economic sanctions could not bring about any real benefits for Belarus, and dialogue remains more efficient. Consequently, EU economic sanctions against Belarus will lead to the isolation of the country: the authorities will not release political prisoners and the general level of fear in society towards the regime will increase, while support for the opposition and any pro-European mood will itself decline. The “evolutionists” support the opposition’s participation in the elections. In their opinion, in today’s Belarus the opposition should use all available legal means at its disposal to communicate with Belarusians. If the opposition fails to participate, then, as their logic has it, it will simply become invisible to most Belarusians. Alexander Milinkevich was the single candidate from the opposition who ran in 2006, but refused to participate in the 2010 elections because of the lack of strategy within the opposition. However, he took part in the parliamentary election of 2012, but the authorities did not register him as a candidate. 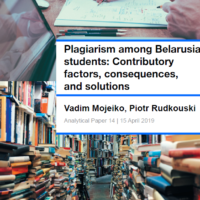 While these ways of thinking remain dominant in the Belarusian opposition today, some politicians may have a position that coincides with the opinion of one camp at one point, and with the opinion of the other camp at the other. For example, a political prisoner and former presidential candidate Mikalai Statkevich opposes any dialogue with the regime, but at the same time feels that it would be good for the opposition should take part in the elections. Both opposition camps agree that the EU should simplify the visa regime, introduce scholarships and the release of political prisoners. However, their tactics on certain issues remain mutually exclusive. It is normal that political forces disagree on certain things. But if the opposition cannot work out a common strategy, it should at least reach a mutual understanding to avoid public attacks against each other. The self-destruction of the opposition is part of the Belarusian authorities’ plan for remaining in control. If the opposition reaches such an agreement, it would break the authorities’ stranglehold on politics. Instead of focusing on how to appear more intelligent and principled by criticising other opponents of Lukashenka, the opposition should think how to garner wider support from Belarusian society and achieve practical goals. The West should also contribute to improving the culture of respecting the views of others within the opposition. This can become a long-lasting contribution to democracy building in Belarus.